Ancient Egyptians preserved the bodies of their dead because they believed the soul would need the body in the afterlife. After death, the soul would encounter a series of tests. If it passed, it would go on to eternal life, an idyllic version of the life they had before death, complete with their well-preserved body and all the comforts of the objects they had loved in life, which were buried with them. The mummification process varied some over many centuries; for example, sometimes the brain was removed, sometimes not. When it was removed, a hook was inserted up the nasal passage and the brain was pulled out bit by bit through the nose. The lungs, liver, intestines and stomach were removed and packed in natron, a kind of salt, which pulled the moisture out. The heart was considered the seat of the soul and intelligence, so was left in place. The removed organs were stored in canopic jars and buried with the mummy or packed back into the body after being dried. 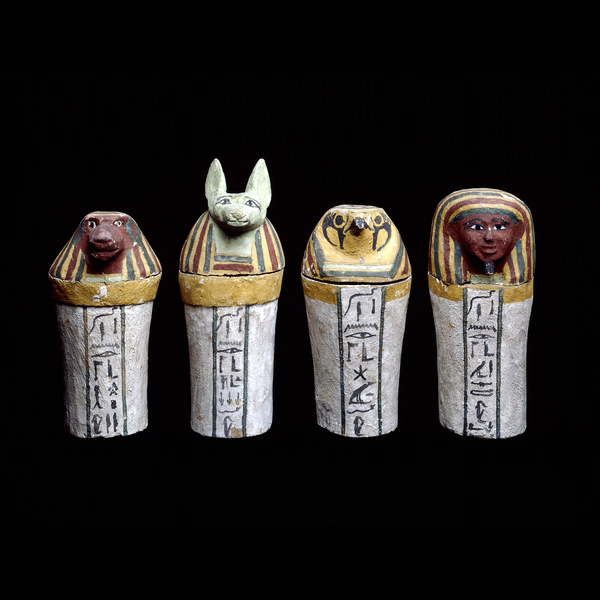 Even when the organs were returned to the body, the canopic jars went into the tomb to protect them. The god Imsety, with the head of a man, protected the heart. Hapy, the baboon-headed god, protected the lungs. Duamutef, the jackel-headed god, protected the stomach. Qebehsenuef, the falcon-headed god, protected the intestines. The body was packed in natron and left for 45 days. Then it was oiled and wrapped in linen strips, which were coated in resin for a tight seal. Amulets were placed around the body inside the wrapping to aid in the passage to the afterlife. The well-wrapped body was placed in one or more coffins, usually more, which were then placed in a sarcophagus. The whole process was very sacred and performed by priests, with prayers and incantations throughout. For the most part, only royalty and the upper classes could afford to be mummified. The poor person’s mummification happened naturally in the super-dry climate of Egypt. Visit the Mummy Room at the Egyptian Museum in Cairo to see royal mummies from the New Kingdom, when the mummification process was most advanced. This entry was posted in Egypt and tagged Cairo, egyptian, egyptian museum, mummies, mummification, mummy room by yalla2013. Bookmark the permalink.